(Phys.org) —A team of researchers with members from the U.K., Scotland and the U.S. has built a functioning acoustic tractor beam in a lab—one that is able to pull objects of centimeter size. In their paper published in the journal Physical Review Letters, the team describes how they built their device, why it works and to what applications it might be put. Tractor beams, as we all know are a staple of science fiction—a beam is emitted from a spaceship that can be used to lock on to other objects, such as another space ship, and then used to move that other object in any direction, most interestingly, in the same direction from which the beam is being emitted—pulling it in. Tractor beams seem counterintuitive as beams of light tend to push objects away, rather than attract them—but, as prior research has shown, optical tractor beams can be created at the nanoparticle level, e.g. optical tweezers. In this new effort, the research team has extended the abilities of a tractor beam by using one based on acoustics, rather than optics. Sending a beam (wave) at an object and having it pull the object closer rather than push it can work because of the scattering of the wave that occurs when it collides with the object and if the wave is sent at an angle to the object. If the scattering and angle are controlled just right, a low pressure zone can be created in front of the object, in effect, pushing it back towards the origin of the beam. In the lab, the researchers used ultrasonic sound waves in a tank of water. They put an array of ultrasound emitters at the bottom of the tank and used a hollow isosceles triangular prism as the object to be pulled. Using an array of emitters allowed for very precisely controlling the wave, which allowed for directing energy onto the outer surface of the object, causing backscattering that led to the frontal low pressure zone, which in turn led to pushing the object back towards the wave source. An analogy would be squeezing a chocolate chip with your fingers, forcing it to move in whatever direction you choose. Because of the stipulations required to make it work, applications that could make use of such a tractor beam are clearly limited, though the researchers suggest it might prove useful in some medical situations. 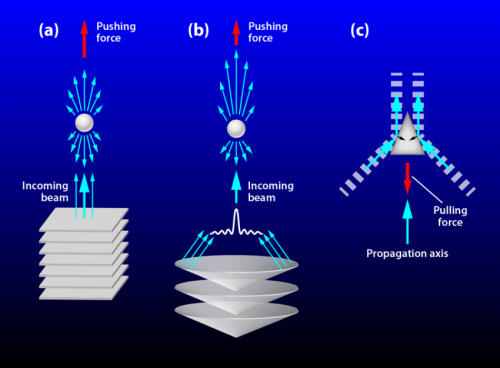 Negative radiation forces act opposite to the direction of propagation, or net momentum, of a beam but have previously been challenging to definitively demonstrate. 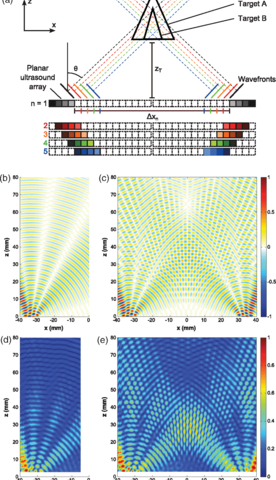 We report an experimental acoustic tractor beam generated by an ultrasonic array operating on macroscopic targets (>1 cm) to demonstrate the negative radiation forces and to map out regimes over which they dominate, which we compare to simulations. The result and the geometrically simple configuration show that the effect is due to nonconservative forces, produced by redirection of a momentum flux from the angled sides of a target and not by conservative forces from a potential energy gradient. Use of a simple acoustic setup provides an easily understood illustration of the negative radiation pressure concept for tractor beams and demonstrates continuous attraction towards the source, against a net momentum flux in the system.